An implant is a false metal root screwed into the jawbone. 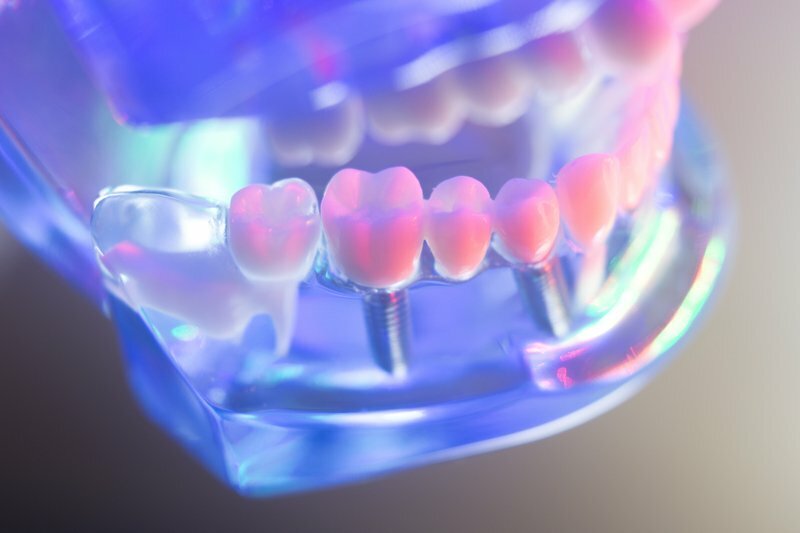 Implants form anchors for a crown, bridge or denture attachments. It is advisable to take the rest of the day off work. You may also need to stay at home for a day or so depending on the type of job you have. If lots of implants have been placed and this has required intravenous sedation or a general anaesthetic then it is important to remember that you cannot drive or operate machinery for 24 hours after intravenous sedation and for 48 hours after general anaesthesia. It is important to keep the surgical site as clean as possible for the first few weeks after the implants are inserted. It may be difficult to clean around the area because it is sore and if this is the case it is best to keep the area free from food debris by gently rinsing with a mouthwash or warm salt water (dissolve a flat teaspoon of kitchen salt in a cup of warm water) commencing on the day after surgery. You will have been prescribed a course of antibiotics to reduce the chances of infection. Please remember to take these. Although there may be a little bleeding at the time of surgery this usually stops very quickly and is unlikely to be a problem. Should the area bleed again when you get home this can usually be stopped by applying pressure for at least 10 minutes with a rolled up handkerchief or swab. Infection is uncommon particularly if antibiotics are used. If you are having an implant placed into your lower jaw it is important to be aware that some nerves may lie close to the site of surgery. One of these runs through the centre of the jawbone and supplies feeling to your lower lip, chin and lower teeth. The other runs on the inside of the lower jaw and supplies feeling to your tongue and helps with taste. Sometimes these nerves may be bruised when an implant is placed. This can cause tingling or numbness in your lip, chin or tongue, and more rarely altered taste. The chances of these nerves being bruised depends on exactly where your implant is going to be placed and how much bone there is around the nerves. I will tell you what the risk is for you. Implants are usually inserted under local anaesthesia (ie an injection to make the area numb) unless access is difficult and/or additional procedures will be required. Once the local anaesthetic injection has worked the gum is cut and pushed back to expose the underlying bone. A hole is then drilled into the bone and the implant screwed into this hole. The gum is then put back in the right place with stitches. These stitches are usually dissolvable but may take several weeks to disappear. It usually takes around half an hour to place a single implant. Obviously if you are having more than one implant placed it will take longer. It is unlikely to be very sore after implant surgery but regular painkillers (eg Ibuprofen) will be arranged for you. There is relatively little in the way of swelling. Are in need of an immediate implant replacement.